Fresh salsa is best when fresh tomatoes are in season but canned work really well in the winter. I will tell you this, "DON'T BUY OFF BRAND TOMATOES"! They are hard and have no taste, buying name brand here is best. We like cilantro in ours, if you don't have a taste for cilantro, leave it out. 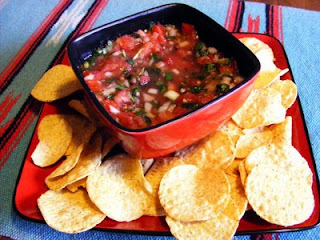 Make sure you have plenty of tortilla chips to eat this salsa with! Mix tomatoes, jalapenos, garlic, cilantro, onion, salt and juice really well. The lime juice keeps the salsa tasting fresh longer, we eat ours so fast it is not needed but I like the taste the lime juice gives. You are ready to serve when finished mixing. This is what I am making today.